I saw this on a video and caught a few screenshots. It is on sale at a store somewhere. Not sure who makes it maybe Samsung. The specs and price are on the sign behind it but I can’t make it out. I’m not surprised. Earlier this year LG developed an OLED screen that is super flexible. The limiting factor for such a phone is probably the battery. Sadly, my iPhone frequently tends to have the same look . I don’t think it is supposed to bend like that . We don’t need a flexible phone. We need a strong and sturdy, old Nokia build quality phone. We need a strong and sturdy, … build quality phone. A phone that can be thrown under the bus! That’s a ‘flip’ phone! Or ‘clam shell’. 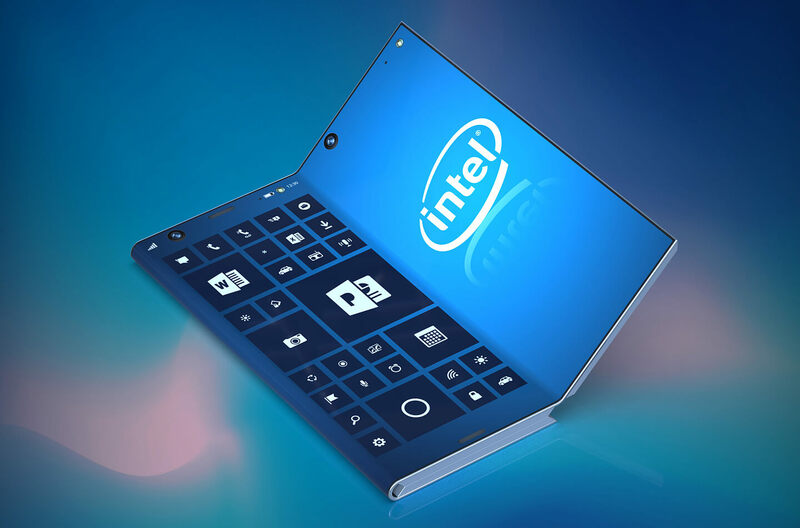 Now, this is a foldable phone! Intel patenteert opvouwbare smartphone met Windows OS, wordt voorzien van drie display delen om extra groot schermoppervlak te creëren. CEO Richard Yu teases "the world's first 5G smartphone with foldable screen" for MWC 2019. Why? Just because we can? How about smaller batteries with a longer life? How about better sound? So much to improve on. Folding seems useless. It would be nice to have a phone that can turn to the size of a tablet for better reading, but that still fits in your pocket. However, I do agree with you that smaller batteries with longer life are much more needed. Foldable phones are mostly limited by tech/manufacturing processes but significantly better batteries require scientific breakthroughs as we don’t have any idea on how to make better batteries. What the companies are supposed to invest on to get better batteries? there is a limit on how much a company can invest on something that will probably fail. Pretty much what he says in the video I shared above. That guy is a very popular and well spoken reviewer of tech gadgets. Mostly phones/tablets. He has nearly 8 million subscribers. Who’s ready to put down 2,500 US$ for a folding phone? Anyone? Saw the entire Samsung S10 lineup on display at Guanghua Digital Plaza. They look neat but are pricey. Salesman said order now and receive it this week Sunday. The cameras are really cool on them.